1. The journey begins with the ‘old and familiar’: these are our patterns, habits, moods and tendencies. This includes all the negative forces that hold us back such as: anger, fear, doubt, low self esteem, apathy, procrastination, anxiety, feeling unworthy, panic, disillusionment etc. There are so many self-limiting forces and most of us have a ‘heady-mix’ of them that busily deceive us. So of course we want to find a way out. The antidote for these ailments, in the first instance, is knowledge… but the more one progresses the more one realises that knowledge alone is not enough. 2. To finally break free from the feelings of not being good enough and the fear of being found out, we need to understand how these patterns and feelings were formed… and how we can transcend or transform them. In many cases the individual needs to know if s/he can ever be free of such feelings. This is because so many begin their journey doubting that emotional freedom can ever be their reality. Once the knowledge of how we can be free is understood our awareness, and with that our desire grows. A euphoria and excitement then fills the mind and body… and now the impossible seems possible. 3. Although greater awareness eventually leads to deeper understanding, to fully understand takes time, reflection and patience. It is at this point of greater understanding that our own expectation for results can undermine our progress. Impatience gets in the way. It expects rewards before sufficient effort has been made and as a consequence we can feel disappointment, which further undermines our progress. So paradoxically at this juncture, when we are on the rise, many relapse back to the old and familiar – hope can be lost as disappointment, frustration and despair return. 4. Knowledge leads us to the door of understanding but it is courage and application that take us through that door. Experience and wisdom then await us on the other side. Application is the key element in this equation because it provides the fuel for change. Those who put what they understand into practice are rewarded with the gift of momentum. Momentum brings about realisation. To realise something is to be driven to put it into practice. It’s such a powerful compulsion that it doesn’t rest until we act. What we know means very little until it is applied. In fact knowledge without application becomes a burden. 5. The fruit of consistent application is experience. Experience has been described through the ages as the ‘greatest authority of them all’. There is little doubt that the power that experience generates within the self is second to none. Experience allows us to see what knowledge can only imagine. It puts us in touch with a level of knowing, understanding and insight that is truly beyond the boundaries of the senses and the limitations of logic. 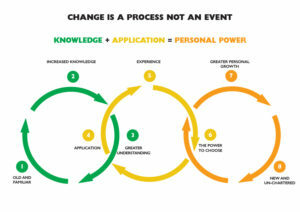 Our own experience then becomes the architect of positive change and empowerment. 6. The more you walk the road of application the more the choices you make are empowering. The power you accrue from the experiences generated by positive action is awesome – but be aware of complacency and arrogance for these are the primary enemies of personal growth. The more personal power develops in us the more humility is needed to channel and focus that power in responsible and productive ways. If one’s ego takes centre stage then reason swiftly retreats – the old traits, habits and tendencies reappear, often in more attractive and alluring forms and before we know it we’re under their spell once more. 7. If we use our experience and personal power in the right way then greater personal growth naturally follows, as momentum is the ‘engine of success’. It is consistent practice that generates momentum; momentum brings about realisation… which makes that which seemed difficult easy. We are then propelled towards the ‘new and unchartered’. It’s at this point that one realises that personal growth is not something to be fitted into one’s life from time to time or at moments of crisis – it’s actually a life long commitment to positive change. 8. The ‘new and unchartered’ is just that… new and yet to be discovered. It is a point of self-realisation where we are awake to the truth about ourselves and reality and live guided by our conscience and integrity. Those who make it to this destination have done so by creating their Story of Health plan where they have equally met the needs of the mind, body spirit and their environment. They have created a set of non-negotiables that they uncompromisingly live by. They live a life of balance and order and so are at peace. Their lives are filled with clarity, beauty, joy and contentment. As they are no longer slaves to the past, they fully embrace each moment with a spirit of gratitude and appreciation. Their celebration of life is so infectious that they inspire others through their example. These individuals live with clarity and purpose… they practise living ‘magically’. Also see: Living with Ambivalence , The Pyramid of Shame and Patternology.